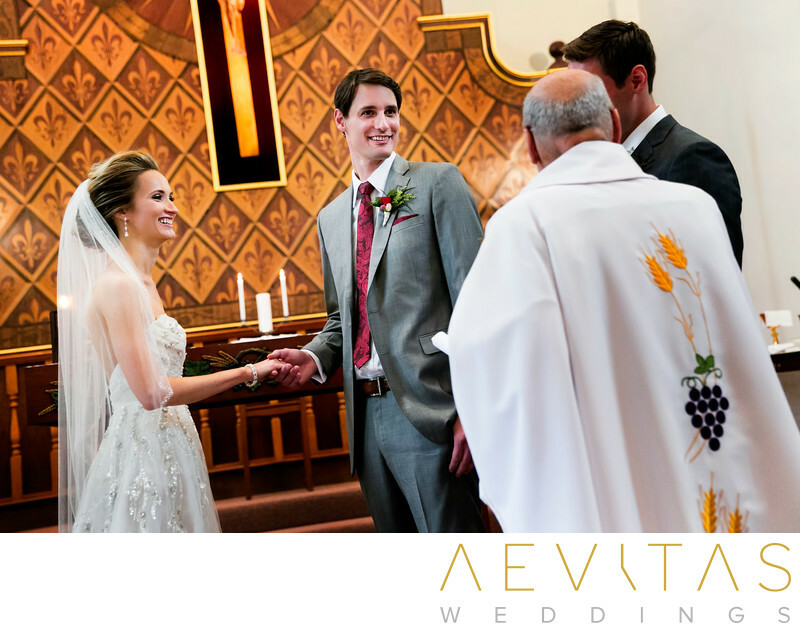 For couples of the Catholic faith, their wedding day is an opportunity to share their love with family and friends, whilst recognizing their God, religion, and the role it will play in their marriage. 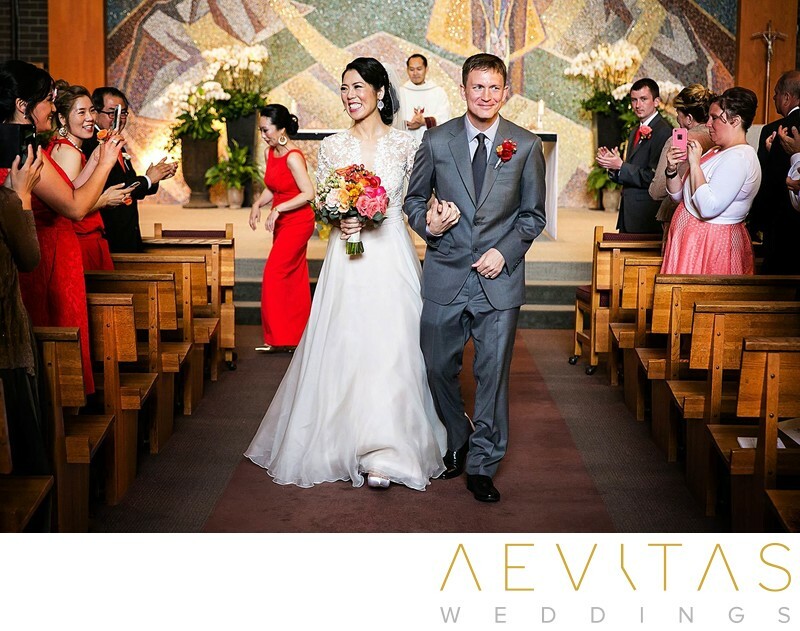 Catholic weddings not only include rites and rituals that have been long-established traditions in the Catholic faith, but also more modern elements that have become popular additions in recent years. 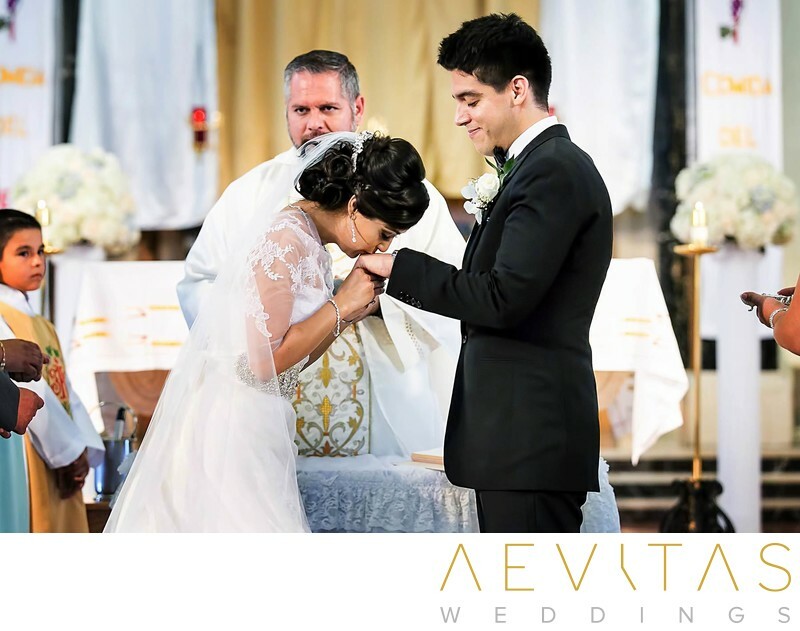 Whether you select for a full mass or a shortened Catholic ceremony, it is a day to invite family and friends to speak the word of God through readings and prayers, and receive blessings for the life you are about to embark on with your new spouse. 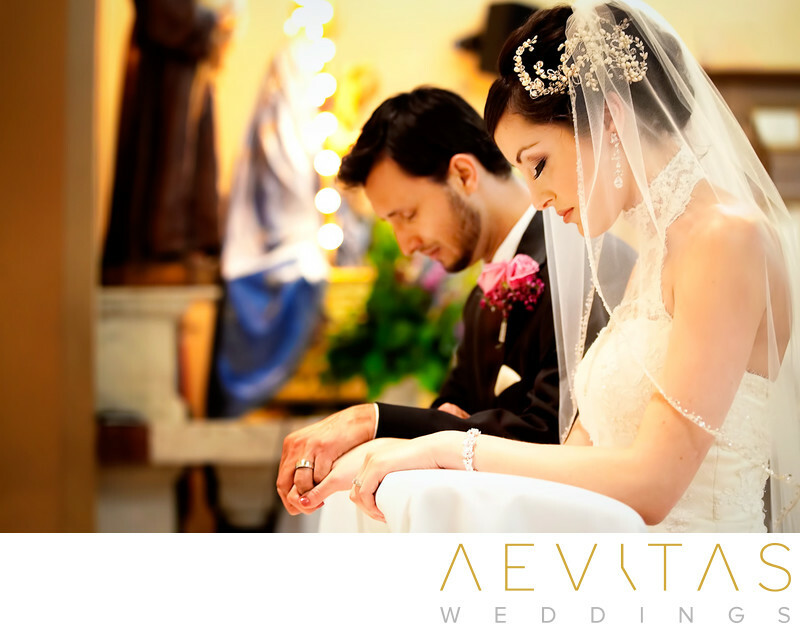 You can exchange traditional vows or customize your own, and incorporate long-standing rituals that recognize a commitment to your faith, including Holy Communion and the offering of flowers to the Virgin Mary. Many Catholic couples also like to incorporate the lighting of unity candles or sand ceremonies that represent their union as one. 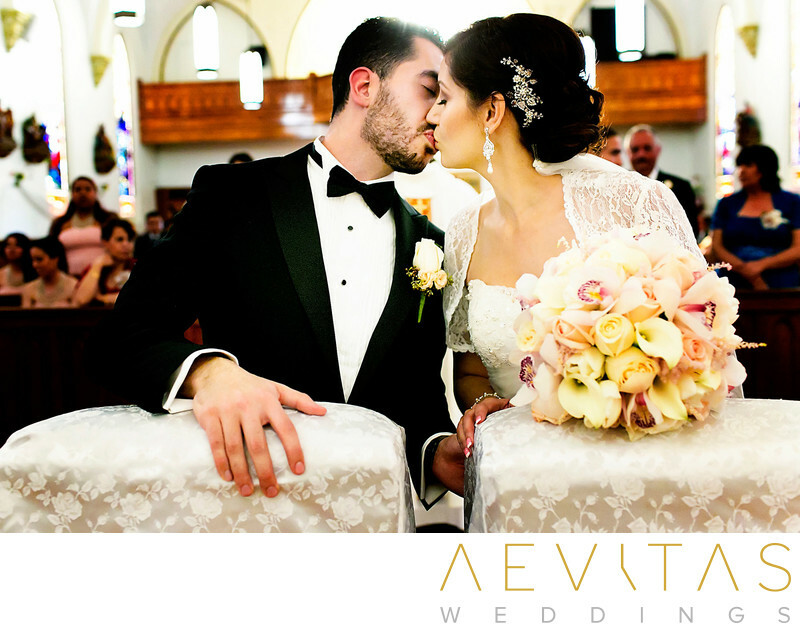 But one of the most important aspects of your Catholic ceremony is being within a house of God that resonates with you as a couple and will provide the setting for beautiful wedding photos that reflect your faith and its enduring importance in your life during this momentous occasion. 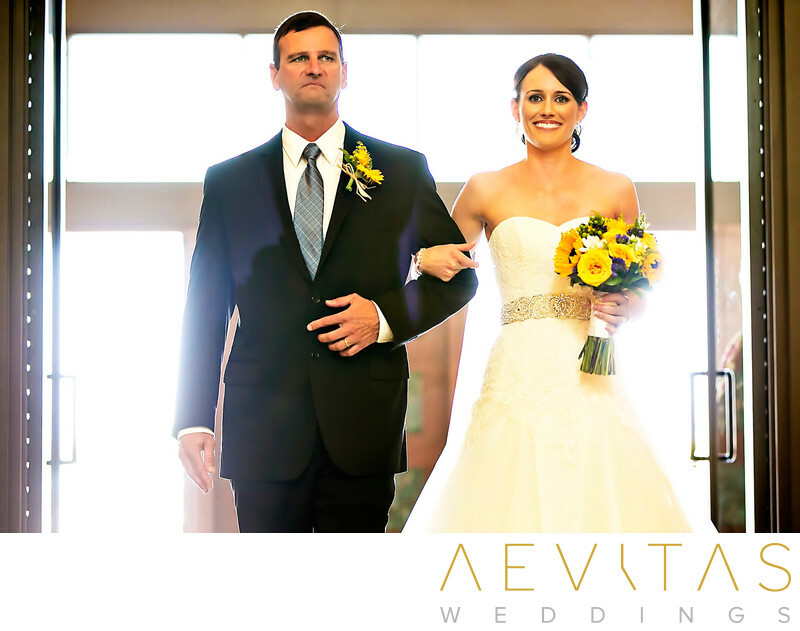 After the priest leads both the bride and groom down the aisle, escorted by their parents, a Catholic wedding ceremony generally begins with an opening prayer by your priest, asking for God’s blessing on your wedding day. This is followed by the Liturgy of the Word, with bible readings and prayers selected by you to reflect on your faith and the marriage you are embarking on together. Often these are read by family members or close friends of the Catholic faith and are followed by a short sermon where the priest addresses the sanctity of marriage and the challenges you may face. 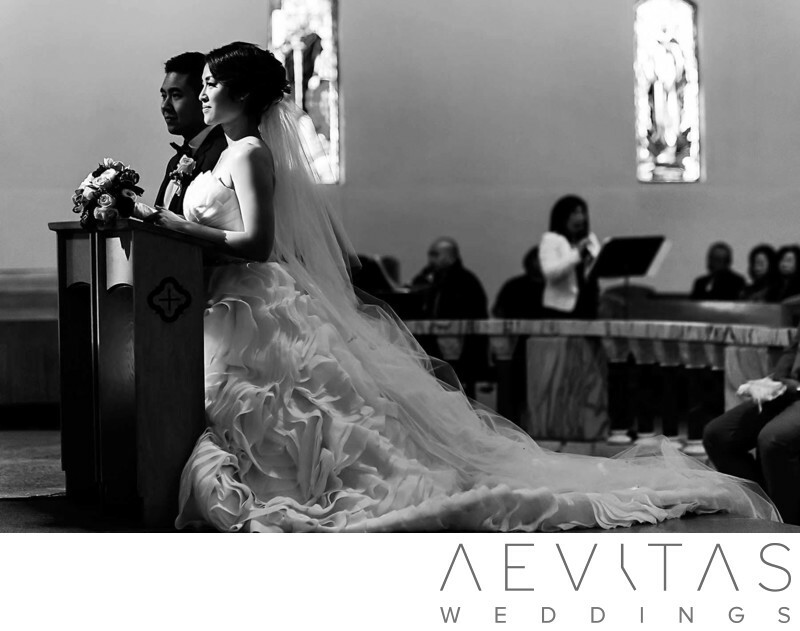 The Rite of Marriage includes the official wedding vows spoken by the couple, followed by the exchange of rings. In the Catholic religion this traditionally follows a structured prose, but many couples also opt for customized or sometimes improvised vows that are more personal in nature. For some couples, the Catholic mass is an integral part of their wedding ceremony, while for Catholics marrying a partner of another faith (Christian or otherwise) they normally marry outside of mass. A full mass includes the “sign of peace, with the priest asking the congregation to shake hands with their neighbors, followed by Holy Communion and a final prayer and blessing for the couple. Held in a Catholic church that is of meaning to you and your faith, we love the opportunity to capture this religious rite as you become joined in God’s eyes, surrounded by your family and friends. With highly ornate religious decor, artwork and stained-glass windows, coupled with an ambiance of grandeur, Catholic churches are embodied with natural elegance that makes them a pleasure to photograph. 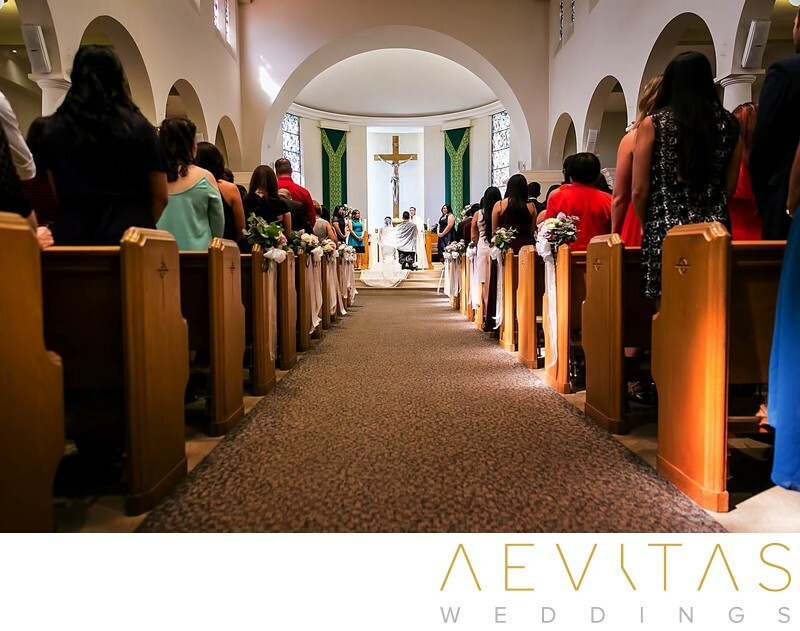 We love the elevated vantage points of many Catholic churches, including second floor balconies from where we can capture expansive wide angle shots looking down across your wedding ceremony. From bible readings to Holy Communion and placing flowers on the shrine of the Virgin Mary, as well as the more modern rituals of unity candle lighting and sand ceremonies, there are plenty of unique religious rituals for us to capture. We love the dimly-lit and atmospheric interior of many Catholic churches, enabling us to get creative with the natural light available. We understand that a Catholic wedding ceremony is a sacred event and always respect the photography rules of the church and operate our camera equipment in “silent mode” so we don’t cause any distractions. With years of experience as photographers and high-quality equipment that includes fast lenses, we know how to capture beautifully-lit wedding day photos in even the darkest churches. 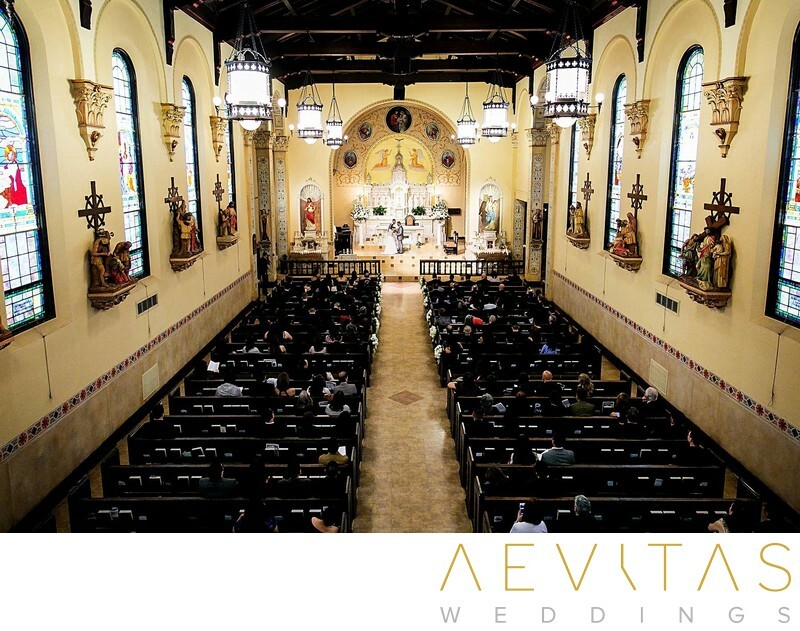 Our extensive experience capturing Catholic wedding ceremonies means that we are aware of the traditional rituals of the Catholic service and mass, as well as the unique elements of particular Catholic cultures, including the hispanic Coin Ceremony and the Honoring of the Ancestors in the Asian tradition. If your Catholic church’s getting ready room is dark and dingy (or not available), opt for a light and spacious hotel or residential room nearby where you can capture beautiful getting ready photos as you prepare before the ceremony. One of our top Catholic wedding tips is to always discuss with your priest the photography rules of the church, and convey these to your wedding photographer so they know what is and isn’t allowed. Select prayers and scripture readings that are reflective of you as a couple, and ask family members or friends who have experience speaking in public to read them. Check with your parish wedding coordinator about what flowers or decorations will already be in the church on the day of your wedding before you start planning, or choose to coordinate with other couples who are holding their ceremony in the church on the same day. 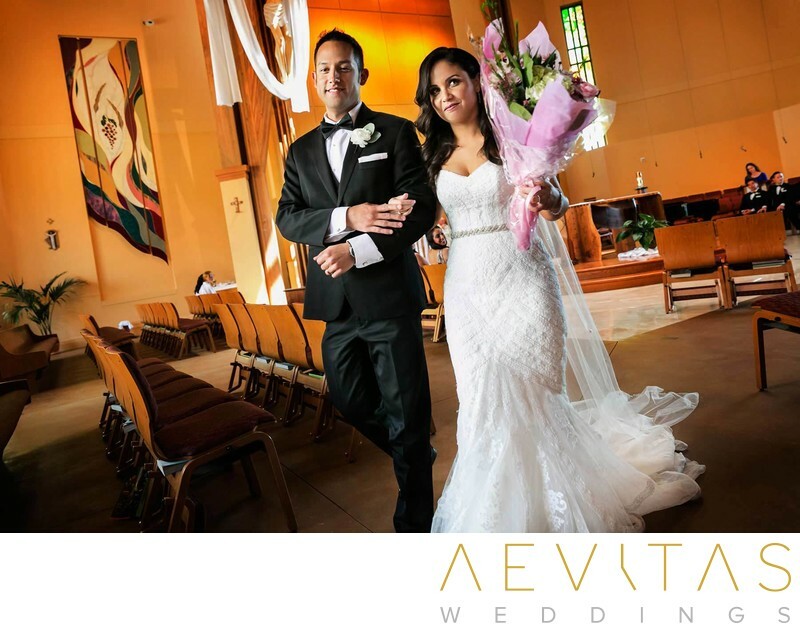 Whether you are having a full mass or not, check with your priest roughly how long the ceremony will take so you can schedule in enough time for couple portraits, family formals and bridal party portraits during your allocated time at the church. Don’t forget the importance of caring for the needy in a Catholic wedding union by either offering a food basket, asking your wedding guests to bring along non-perishable food items to donate, or setting up an online charitable wedding registry.